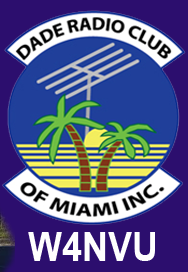 January 2012 DRC Board Meeting – W4NVU – Dade Radio Club of Miami Inc.
Miguel presided over the meeting and welcomed everyone. Classes and testing is being done in the other room. Everyone took turns and stated their name and call sign. Miguel reminded everyone present this morning to sign in. Minutes were posted online and were approved. Corresponding Secretary – Virgil stated that he picked up the mail from the PO Box. It contained a renewal form for the PO Box and a statement. He gave them to Esther. He requested that the mail be forwarded to his house. It was discussed that there may be an additional fee to forward the mail from a PO Box. It was decided that if there is an additional fee, we will pay it so that the mail can be forwarded to Virgil. Treasurer’s Report – Esther stated that we have money in our savings and checking accounts. The insurance for the club has been paid. However, we need to fill out forms so that the equipment will be covered. There are a lot of questions and information that needs to be put in and then they will send you a quote. We need to get a detailed list. Ray stated that they charge $1.50 for each $1,000.00. Miguel will put in the information required, get a quote and have it approved at the next meeting. Next, a Club Pay-Pal account was discussed to put on the website to collect dues and take donations. We have to find out if there is online access to the bank. It was also suggested to have a separate account for Pay-Pal so that if something happens, they don’t hold up our entire account. It was also suggested that if someone pays their dues by Pay-Pal, that an additional 3% will be added to the $30.00 or $35.00 dues to cover the costs. Our corporate renewal was received via email and Esther will send it in. Membership list for 2012 – Esther will update the list. WE have 36 members; 26 of which are paid. Carl suggested that we have job descriptions for new members so that they can become more involved. Website/Newsletter – Ryan is adding a calendar to list all events. Ray suggested to also have a link to the ARRL webpage. Everything is back online. Membership is still not working, but he is working on it. Hamfest was discussed. Tom is looking for a suitable site. It will take place on the super bowl weekend next year. Ray advised that the date is bad for us, but good for the vendors. Different facilities were discussed. Tom is going to check with Homestead Speedway. Tamiami Airport wanted too much money, tents and port-a-potties, etc. We could go back to the Youth Fair Grounds. The Moose Club was also suggested. Tom will report back at the next meeting. The Hamfest will take place Friday evening and all day Saturday. Nothing on Sunday. Tom will also head the Vendor Committee. He will go to Orlando and get cards from different vendors and try to get more donations for raffles. Tom wanted business cards from the club for the Hamfest stating that it will be the first weekend in February 2013 and have the website listed. He will redo the website. It was discussed to use the Hamboree name in the future. Ray suggested that we not use Hamboree because people don’t have good memories at the end. It was suggested that we call it Miami Hamfest and use MiamiHamfest.com. Ray will change the webpage. Social Event Coordinator – Agustin. T-Shirts and polo shirts were discussed. Tom will modify the Tropical Hamboree logo and change it to Miami Hamfest with the Palm Tree. Esther advised that she had paid $16-$20 per shirt for the Dade Radio Club Member Events. Miguel requested a polo shirt with a pocket. Field Day was discussed next. For June 23 and 24 in Florida City. The club will have a picnic in Mid-October (TBA). Emergency Committee Chair – Carl. Miguel is the Ares/Races Officer. 147.000 – Merritt was on speaker phone. Merritt emailed a list of what is needed to the repeater. Ray said that we need to use commercial grade equipment and to keep as much as possible. Since it links Monroe to Miami-Dade County and is used to evacuate the Keys, Esther suggested that we get a grant from FEMA. Carl needs an exact list of material that we need to give to the grant writer. Ray said that we should ask John Vecchio for his advice and go with what he says. After a lot of discussion, Merritt will put together a Plan A and a Plan B. said it is dead. Ray stated that we need a backup to 147.000. Carl said that we need to go with what we have and then look into getting a back-up repeater at an alternate site. A motion was made by Miguel, seconded by Joanne, to approve $2,418.00 plus any delivery charge for 2 exciters T 301; 2 receivers R 303; 1 controller 7330; 2-100 power amps, with the antennas that were already approved, and the hard line connectors, and any delivery charge, for $3,575.00 for the whole package. All were in favor and the motion passed. Merritt will get an invoice from John and the club will cut a check. Merritt will advise when he hears about the tower crew. 224.200 – it still down. The club will not repair it now. It is at Robert’s house. All UM repeaters – the club will do nothing for now. It was discussed to re-activate a UM Radio Club. Carl and Ray are already working on it. It was discussed that there is no real interest and to not do anything right now. 147.760 – Ray said it’s up and running. 444.200 – It is working OK. The controller we purchased last year was installed. Digipeater 144.39 is working OK.
D-Star was discussed. We had equipment donated and we need a site. Other possible repeater sites were discussed. A committee of real estate people – Miguel and Agustine – was set-up and they will get back to the club on possible sites. Club Elmer Committee Person was appointed for new Testees. New members will get a package. Frank will be in charge. Public Information Officer is Frank. School Instructor Committee Member is Armando Flores. Testing Coordinators are Mike and Dave. The website will automatically give our testing information to ARRL. It was discussed to change the testing time to 6:30 PM so that the VE’s can attend the meetings. Monthly events will continue to be done by Miguel. Membership card were discussed. Carl will check into it. It was requested that they be vertical. The Board Members will meet again on Saturday, April 28 at 10 AM and will have pizza at noon. Miguel thanked everyone for coming. A Motion to close the meeting was made by Esther, seconded by Agustine. Voted and passed. The DRC Board meeting was adjourned at 11:30.